I rode and raced this bicycle all through the 90s with the exact set up it has now, except for one thing. The bicycle is a 59cm Bianchi SBX frame and chrome fork. The wheelset are Campy Euros, straight and true...no skips, hops, bumps, or problems of any kind. The tires are New Challenge Criterium 700 x 23c. Perfectly tuned with no problems. Frame has never been damaged, never wrecked, fork has been fine as well with no damage and never wrecked. Headset is installed perfectly fine with no looseness and properly seated. When I raced, I weighed between 135 - 145 pounds at 6' tall. I am now about 175 pounds, probably shorter. ha. I don't seem to be experiencing any issues with flex, etc. On the flat, I can buzz along no problem for long distances at 17-24 mph and everything feels perfectly secure. Climbs like a dream. On short downhills that are techy and curvy, I can zip side to side, leaning, steering, etc with no problems at all. Even on uneven pavement around corners at 28-32 on gentle downhills going into uphills...no problems at all. On Long, fast downhills...here's my issue. I can't go over 28 mph. The second the bike gets close to that limit or threshold, I get wheel wobble and it's really bad. 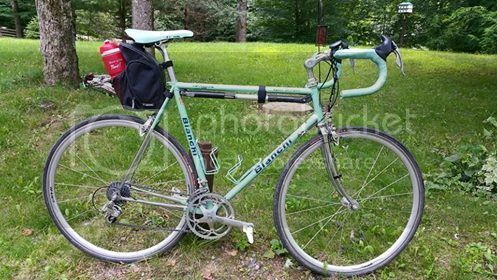 I first noted a couple years ago after doing a longer ride and coming home, dropping down a hill that gets you going over 55 mph and I had done so with other road bikes that same year, including a Bianchi Alloro with the same weight and geometry. But the SBX....this bike was humming along good and then it started at about 45 mph. I was able to stand off the seat a bit, lean back, squeeze the top tube with my legs and I had to brake...even though I know you shouldn't or at least that's what I have since been told...the hill drops to the faster part and I needed control as I was going down. It was by a hair that I didn't go down hard. After that...i noted the shimmy anytime there was a long descent and noticed it would start a little at about 28 and then get really bad shortly after 32. Only thing that is different from my race days to modern days in my stem. I placed on, and please don't give me grief, a adjustable UNO to try and bring the height up and easier on my back and body. My old stem was a 3T that was about 130 long and a good neg degree downward. I raced steep and stooped and fast. I have put on wider bars since I began having issues and it did seem line it stabilized a bit, or I thought. But today, I did a long ride, and coming to a long downhill...it started again and it was horrible. I ended up cruising for 3 miles down at 25 mph and on the brakes to maintain a comfortable ride but this is a 40-50 mph steady road on a road bike usually. I've attached a pic of the bike. I will try and get another. I was standing up for this pic and it sort of makes the fork look wonky but it is not. I know the first thing I will probably do is, lower the stem, level it out. I have to say that I sort of did that once already and didn't notice a difference but I believe I am going to do it again and see. The bike is super comfy, still goes well at low speeds and feels good everywhere else except the issues above. I thought once, maybe it's just a race ready frameset and I am not that race ready anymore. To give an idea of distance today. I went 46.5 miles, very comfortably at 17+ mph average over hilly terrain. Only place I have issues...downhills. And in Pennsylvania...there are a ton of short 35+ downhills leading to short steep hills. It's nice to be able to coast into them but right now...that isn't happening. I used to have the drops level with the tips of the shifter/brake levers. I've since have back issues, as well as a recent broken right shoulder that required surgery and rotator cuff repair. So I have to think comfort as well. lower the stem, level it out? shorter stem? Is this just an aggressive or more race ready frame and am I just too old and not that zippy anymore? Looks like a 54cm frame, when you've got enough seat post exposed to be on a 60cm frame. Longer wheelbase, more stability. Also, PA as everywhere else that experiences winter, are probably not as smooth as your youth. Can you put wider tires on for a bit more cushion? Check rims for being round too, they may a a flat spot not noticeable until you really get going. It's definitely a 59 cm bicycle. I know my roads are choppy and sketchy but, no worse than usual and like I was stating, the back roads twisters and short downhills aren't a problem. I have had 700 x 25, 26 on it. If you look at the space between the seat post and tire, anything beyond that is practically rubbing. Rims are smooth and no flat spots at all. I've had them off, tires off, trued and checks for hops and dips. I worked as a bike mechanic and owned a shop all through the 90s. It's what is really troubling is the differences from then to now. What do you think about the stem? Would the raised stem and higher rise be an issue? thanks for your feedback. I should mention that my standover is a long inseam in comparison to my upper body. probably 34-35 in. I ride with a very slight bend to my knee. Very smooth pedal stroke usually from years of riding and training in my race days. Also, do you think a change in fork with a different trail would make a difference? I hate to scrap a frame that usually feels so good except in one area....The top tube is ~59cm as well. long wheelbase...i can't remember the exact measurement on it. Last edited by pamaguahiker; 07-03-15 at 07:13 PM. in my experience there are two possible causes for a speed wobble (shimmy). a) wheel dish, have you checked both wheels with a dishing gauge? b) frame alignment, you could start by facing the shell and checking frame with a straightedge. check fork in a fork alignment jig. if machine passes these tests ok and you still have the symptom then it must be inherent in frame/fork geometry. I've checked wheel dish and it is spot on. I have a wheel dishing tool, etc. The frame appears to be in perfect alignment. I forgot to mention and you bring it up with the fork. The Chrome fork is original from 93. I used it for less than 6 months before I dropped a Time Carbon on it and used it for everything. A few years back, I changed it back to the original. So, I am wondering about that. I do have a frame and fork jig. I checked the frame and it is good. Does anyone think the stem and height may be an issue? Maybe change the fork back and see if it still happens? That Uno stem may not be as stiff at speed as a one piece stem. I've thought about the UNO as well. Too many areas of potential movement even if it does feel tight. I do feel that a change of fork may help determine things as well. maybe the original chromed fork isn't up to par. Thanks for the feedback. The only possible solution I can think of is to simply give it to me. I don't have hills that big around here so I seldom go that fast so wheel wobble will not be an issue. I think the fork looks a tiny bit bent. I also agree it does look a tad smallish for a 59. Did it do this before the new tires or just after you put them on? Straight or not they could have a broken cord or two that is not noticeable until you ad your weight to them. I would try dropping the stem and bars down (even if you just do it a few miles from the hill) to see if more weight on the front fixes it. Try a different set of wheels if have or can borrow them. Check your axles and make sure you do not have bearing issues. You may have to go back to the carbon fork. Last edited by Bianchigirll; 07-04-15 at 05:46 AM. That's a big seat bag in the first picture. Is it there when the speed wobble occurs? A lot of weight in the back that isn't secure could probably be a factor. I actually went back and measured it...because for some strange reason, I began to doubt myself. It's 59 cm c to top of the top tube. That's what I have always rode. It will wobble whether the back is on it or not. And it is a front wheel shimmy that launches into the wobble. Always the front. I have rode some other road bikes, of course, in between riding this and they never wobble and I can bomb down hills with no worries. I use the bag only for really long distance rides so I can put on 3 waterbottles since the availability can be sketchy for water stops. The front shimmy will start even with or without the bag. Sorry Bianchgirll I love the bike and really hope to get some resolution before pouncing into that direction with this ride. I am thinking the fork may have to be changed out. Maybe go back to a carbon as well. I just want to make sure I find one with the right rake. I've tried it with other wheelsets and still get the front shimmy. The bearings are all good and no problems at all. I've checked those out as well. dropping stem down and level and give it a ride. and catch a few downhills. I will know right away if that's the factor. if that doesn't solve it....change out the fork. I sort of forgot about the seat bag but that was what I was driving at with the bars, maybe too much weight is shifted to the rear. I use some pretty tall stems and never notice an wobble but generally the only hills I get moving that fast on are pretty beat up anyway. Did you try swapping out wheels? At least the front? The wheel base on that should be 990.7 for a 59 and 978.5 for 57. The rake 42 and trail is 56.9. The catalog doesn't give an axle to crown measurement but I would measure that. It is always possible the fork is off a bit somehow, bent to the side, one dropout slightly out further than the other and you just never noticed it years ago. Thanks for the specs. I will make sure I keep the rake in mind when looking, if it would come to that...which I think I am just going to make the leap and grab up a carbon. They're not that pricey anymore. Just have to decide which one. But I did swap out the wheel. No difference, still had the shim. And I have definitely rode it without the bag. Same effects. It really keeps going back to the front fork...the probably culprit. I have all the 80 and 90s catalogs as well. It helps to be able to look up all the specs and measurements. 1. Check the headset adjustment again. If it seems right, move on; but if you fail to find the solution elsewhere, come back to the headset and try something else: a tiny bit tighter? A tiny bit looser? Change caged balls to loose balls? I know it sounds like grasping at straws, but: always suspect the headset. 2. Move the saddle forward. Disregard comfort, for now! Just move it forward and go for a test ride. Anything changed? 3. Flip the front wheel around and go for a test ride. Anything changed? I doubt changing the fork will be the solution if it isn't damaged. I've taken an interest, lately, in relative loading of the wheels. That's what you're thinking, when you consider changing the stem, right? If so, you may get the same effect by moving the rear wheel back in the dropout, or moving the seat forward. That frame has semi-vertical dropouts so not a lot of room to move the wheel back and it goes up at the same time. I am a strong seat climber. I sit in the saddle and grind with of course the periodic standing but, I sit far back on the saddle. I have played with the dropouts and moving the wheel. It is indeed moved further back and Bianchigirll is correct in the sense of the drop outs not allowing much room to move back. It's interesting you stating about flipping the front wheel around, etc. I actually did that mid ride when i got my first shimmy after checking the headset, etc. I've just about tried every trick in the trade on this one. Another interesting thing to note. I went and looked at the bike today and did some additional measurements. And I found something very interesting. My chrome fork, that I thought was the original...it has Tange dropouts. There is no way this is the original fork. So now I measure the wheelbase and it isn't close to the correct specs. I think it is time to move on the fork theory and test this out. just won't be for a bit, til I round up a correct fork. But yea...the Tange drop outs were a big red flag. I went back through my other forks to see if I had the correct one but no luck. I wonder if I mixed it up somehow. OH yeah I sort of missed that. I was really looking hard at the curve and how the upper part of the legs lined up with the headtube, so I totally missed that this fork has a crown. 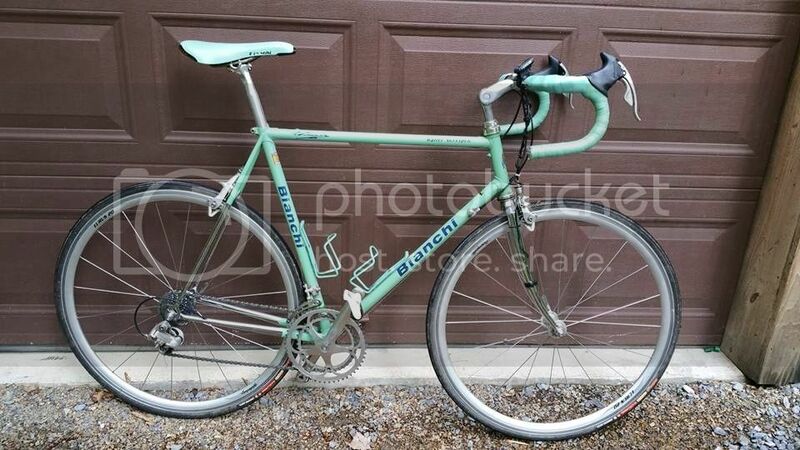 These bikes/frames came with a nondescript unicrown fork wif Bianchi dropouts. Glad we got that figured out for you. When you get that fork off, do you plan on measuring the rake? It's hard to tell from the pictures but it may have a lot of rake which would result in low trail, quick steering. I'd like to know what the numbers are. I think that a quick front end may sometimes contribute to shimmy. I am think straight up...that this may be a high rake indeed from the looks of it. I am going to consult my Bianchi guide and find the right and correct original fork rake and go from there. And from my prior experience, that quick front end is squirrely as hell. Back in the 90s, a Giant rep gave me a Giant team frameset that was Time Trial specific to use. He was tired of seeing celeste in my stable even though my Bianchi rep really set me up well with framesets and some parts for free, and Cannondale even gave me a frame once as well. They all wanted me riding their equipment. So I reserved the C-dale for crits so I didn't care if I wrecked it because I despised the rough and harsh ride...it was a 2.8 series. And I gave the Giant a try. It was a true TT bike from the team and Wow...it was bad. I hated it so bad, I let another racer friend give it a go...same response. We were amazed that anyone could keep that thing under control and straight. So yea...i will try and get some numbers. Bianchigirll...good eye after I mentioned it too. I didn't think about it either until I started looking it over. Wrong fork indeed!